We carry an excellent assortment of Western replica rifles and shotgun replicas that are authentic reproductions of firearms used during the Old West. Western rifles were very accurate and deadly from long range. Cowboys used them to fend off Native Americans and cattle hustlers, and the U.S. cavalry used them against criminals like stage coach and bank robbers. Our collectible rifles and cap rifles have functional lock mechanisms and parts, but they do not fire live ammunition, making them ideal for theatrical productions and costume events. 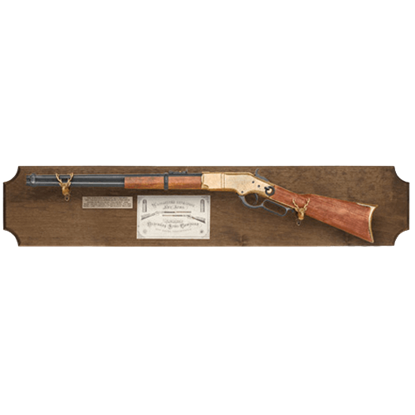 These Wild West rifles come pre-assembled and ready for display in your home or office. Many of these gun replicas are made from antiqued metal and polished European hardwood. Our inventory includes designs like lever action rifles, Winchester rifles, Western carbines, and double-barrel shotguns. Some of these Western firearms are even displayed on plaques that can be hung on your wall. Originally developed from the Henry, this rifle became famous for its rugged construction and lever-action breech mechanism that allowed the rifleman to fire a number of shots before having to reload, hence the term, repeating rifle. In 1866 Winchester released its first repeating rifle, which became a favorite of gunmen in the days of the wild west. And now, you can celebrate this rifle too, in the form of this 1866 Winchester Golden Boy Dark Wood Display Plaque. 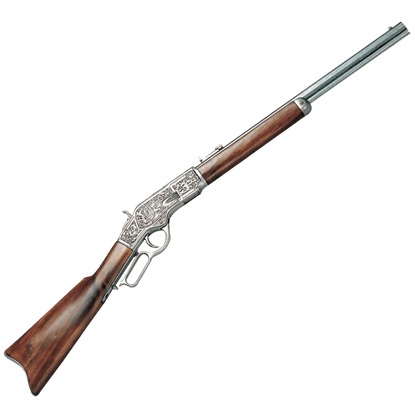 In 1866 Winchester released its first repeating rifle, which became a favorite of gunmen in the days of the wild west. 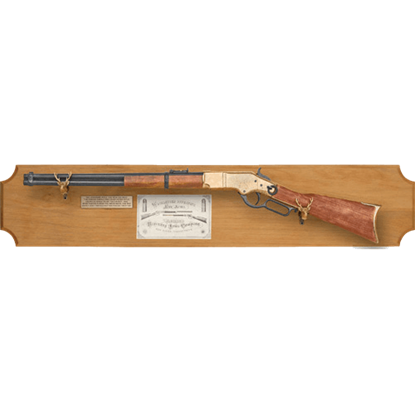 And now, you can celebrate this rifle too, in the form of this 1866 Winchester Golden Boy Wood Display Plaque. Famous for its rugged construction and lever-action mechanism that allowed the rifleman to fire a number of shots before having to reload, the Model 1866, was nicknamed Yellow Boy because of its brass receiver. 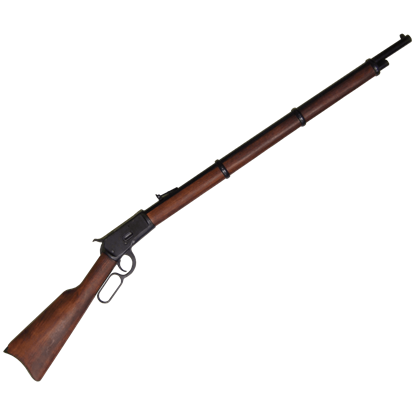 The 1892 rifle, descendant of the Henry and 1866 rifles, was made from 1892 until 1941 and total production was in excess of one million pieces. Many variations and calibers were introduced over the course of its 50 year production. In the days of the Wild West you lived and died by the six-gun at your side. None were more reliable than this one. 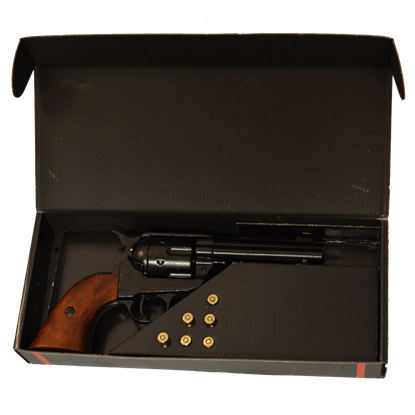 The Black 1873 .45 Colt Peacemaker Box Set contains a revolver and six bullets, paying homage to this pistol. Calling shotgun when getting into your car originated in the Wild West. Originally, guards would ride next to a stage coach driver with an Black 1881 Western Stage Coach Shotgun to help keep the coach, occupants, and cargo safe. The 1892 lever action rifle might have debuted after the days of the Wild West, but that did not stop it from becoming an icon of the era! The Black 1892 Lever Action Western Carbine is a stunning replica of this iconic rifle. Winchester returned to its roots with the Model 1892, which, like the first lever-action guns, was primarily chambered for shorter, lower-pressure handgun rounds. 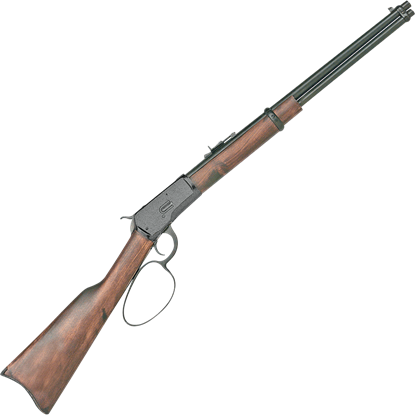 The Model 1892, however, incorporates a much stronger Browning action.